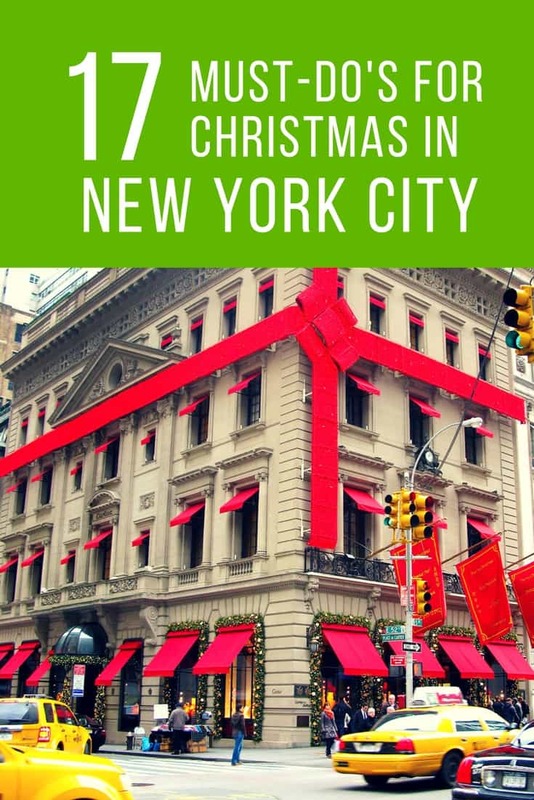 New York City is far from cozy, but there’s something about Christmas in New York that makes its glamour irresistible. The first two weekends in December are the most crowded with tourists. New York is surprisingly quiet during the actual Christmas week. The holiday season in New York delivers a special opportunity for families to enjoy parades, markets, holiday lights, museums, and shows unlike anywhere else. A holiday weekend for tourists in New York can be filled with shopping, but we think the best gifts can’t be put under the tree. We love to give our family experiences. Here’s a list of our favorite family traditions in New York City— some free, some under $100, and some ultimate bucket list itineraries. Although November sees holiday decor and events happen earlier and earlier, the Macy’s Day Parade gets the city in high holiday gear every Thanksgiving. The massive floats and balloons of famous characters are mesmerizing to watch, from Spider Man to Sponge Bob, to the Jolly Green Giant. Ho, ho, ho! 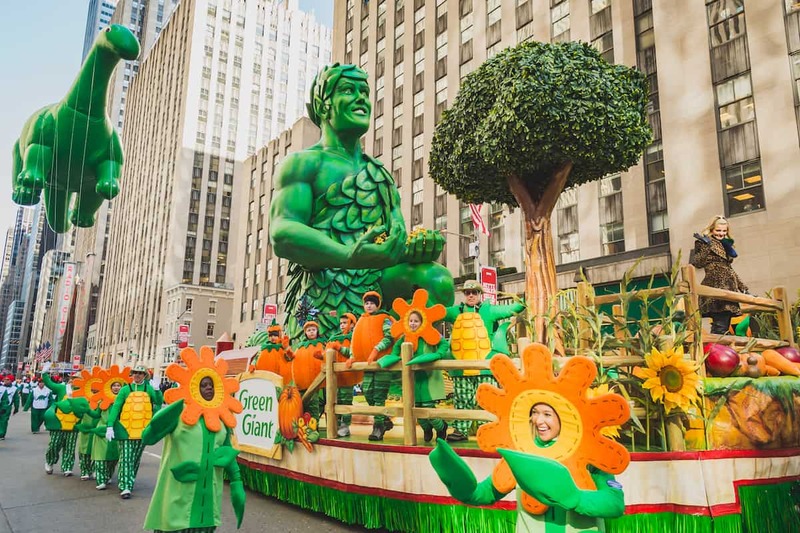 Green Giant broke the Guinness Book of World Records and prepared the largest portion of green bean casserole ever to celebrate their first time in the Macy’s Day Parade. They then donated each portion to Meals on Wheals for the elderly in New York City. The parade begins at 77th St. and Central Park West and goes down the western perimeter of Central Park to Columbus Circle. The the route cuts across Central Park South until it turns South on Sixth Avenue and continues down to 34th St. to Macy’s at Herald Square. Those determined to get great views show up as early as 6 AM along Central Park West from 59th to 75th St. Alternatively other viewing areas for the public are on Sixth Avenue from 59th to 38th Streets. If you’d like to see a bit of the parade without being in the chaos at street level, check into a hotel on the parade route. 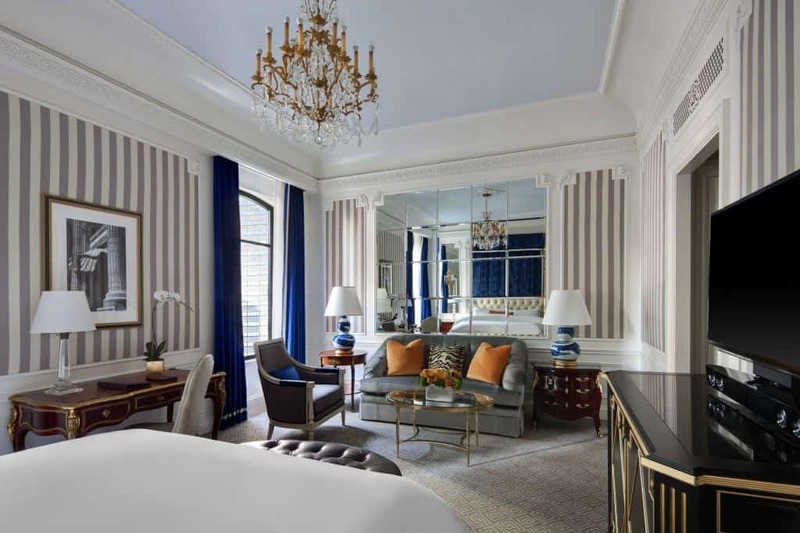 The Mandarin Oriental, The Ritz Carlton Central Park, and the Essex House are along the route, but they charge premium prices on this special day where their location is everything. For those who want to sleep in, you can watch the parade live on NBC at 9 AM Eastern on November 23 if you do not want to brave the crowds. The Radio City Christmas Spectacular runs from early November until January 1. I lived in the Big Apple for nearly a decade before I finally saw this fabulous show. It’s wonderfully engaging for children three and older because there’s simply so much to see. With live animals, video, large scale chorus dances with massive sets, everyone must see the collapsing Rockettes toy soldiers at least once. 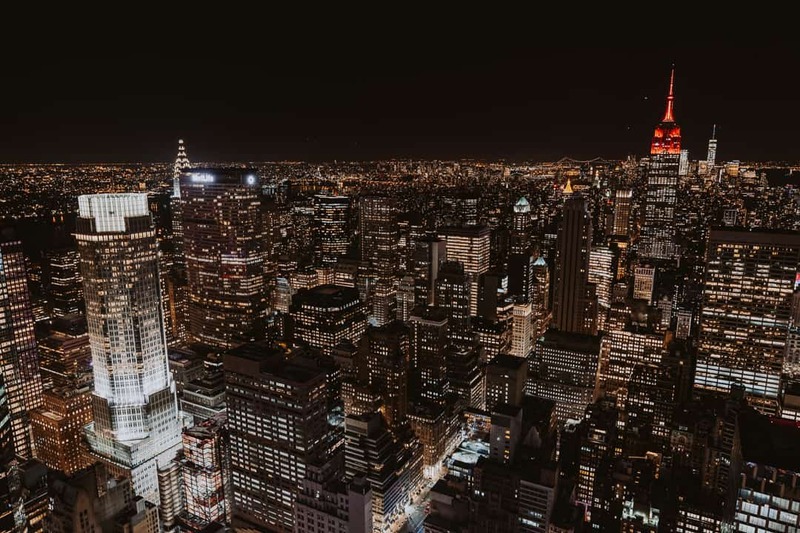 The Radio City Music Hall is located near the iconic Rainbow Room, so grab a table at Bar 65 before or after the performance to enjoy drinks and dinner on the 65th floor of 30 Rock. 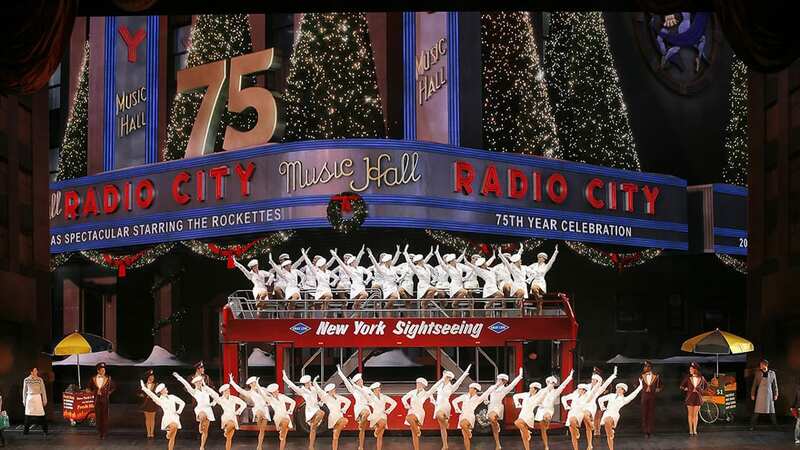 The Rockettes travel around to city icons to inaugurate the holiday season including the Empire State Building, the tree lightings at Rockefeller Center and the New York Stock Exchange. 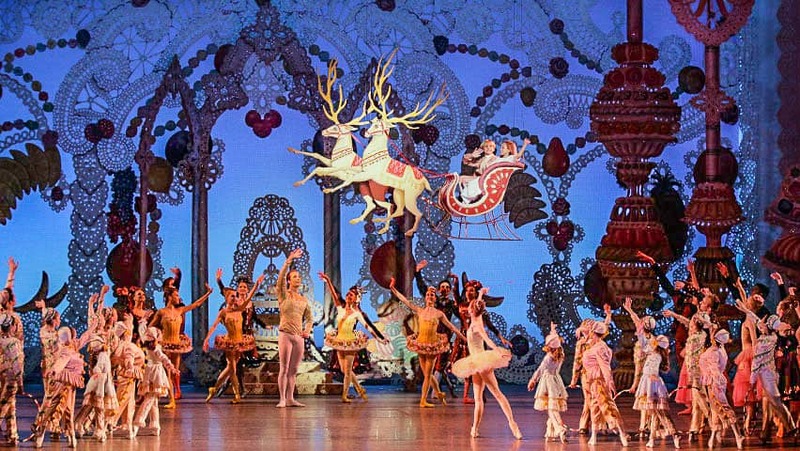 New York City hosts several Nutcracker performances every holiday. There are multiple options from those performed by local dance companies as well as those traveling through. The New York City Ballet offers the most traditional performance at Lincoln Center. It’s Balanchine’s holiday dance in full glory at Lincoln Center. Photo courtesy of the New York City Ballet. 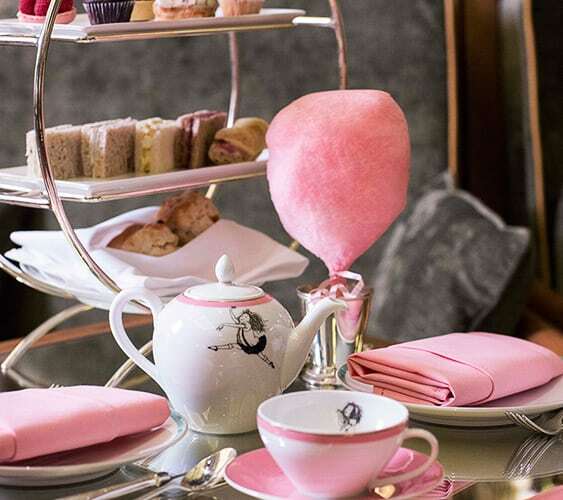 The Eloise Tea at Palm Court is a must. As of Thanksgiving weekend, Eloise, the Plaza Hotel‘s most famous resident, is joined by Santa Claus for photos and merriment. A fantastic holiday celebration with your family is starts with Eloise tea in Palm Court before heading below to the concourse level to see with Santa. There are several holiday events targeted for young children with Eloise or Santa in November and December like Hanukkah celebrations and gingerbread house decorating. There are more informal child teas in the Eloise salon if your brood is too big or your kids too young to enjoy Palm Court. Check the Plaza’s website for these events scheduled in the Eloise room off the wonderful Plaza food court which is a great place for purchasing exquisite gourmet gifts. The Eloise Suite next to the Plaza Food Court and Santa’s pop up home hosts a variety of holiday activities for children. The Carlyle, one of our favorite New York hotels offers Madeline’s Tea every Saturday from the beginning of November to the end of December. There are seatings at 10:15AM and 1PM and include a sing-along around the piano at one of the New York hotels with the most impressive jazz pedigree (at Cafe Carlyle). 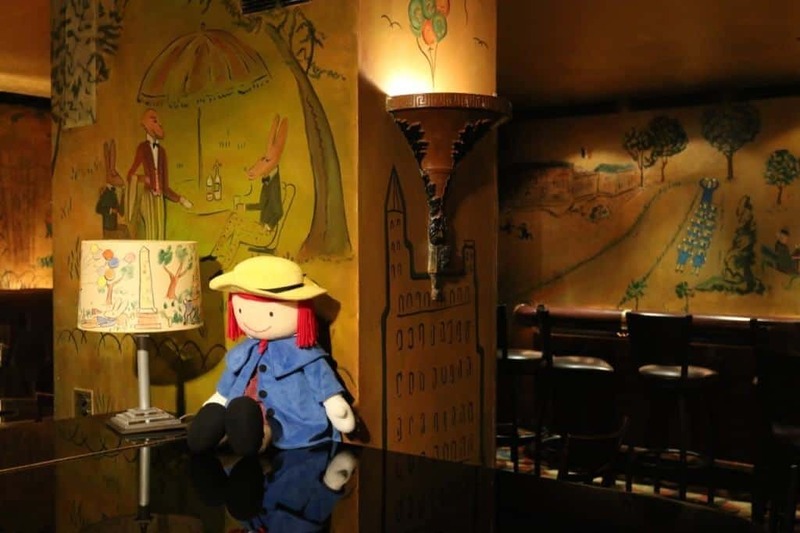 The tea takes place inside Bemelmans Bar, whose murals were crafted by Ludwig Bemelmans, illustrator of the Madeline books. Madeline makes a cameo appearance on the walls, too. have a shampoo and blow dry together before attending the Madeline Tea to make you picture perfect. This combo service costs $125. Macy’s has their own holiday celebration that begins the Friday after Thanksgiving called Macy’s Santaland. It’s not a simple meet and greet with Santa Claus inside of a shopping mall. Santaland is a multi-room experience somewhat like It’s a Small World at Disneyland without the boats and lots of elves. A picture with Santa finishes the experience. 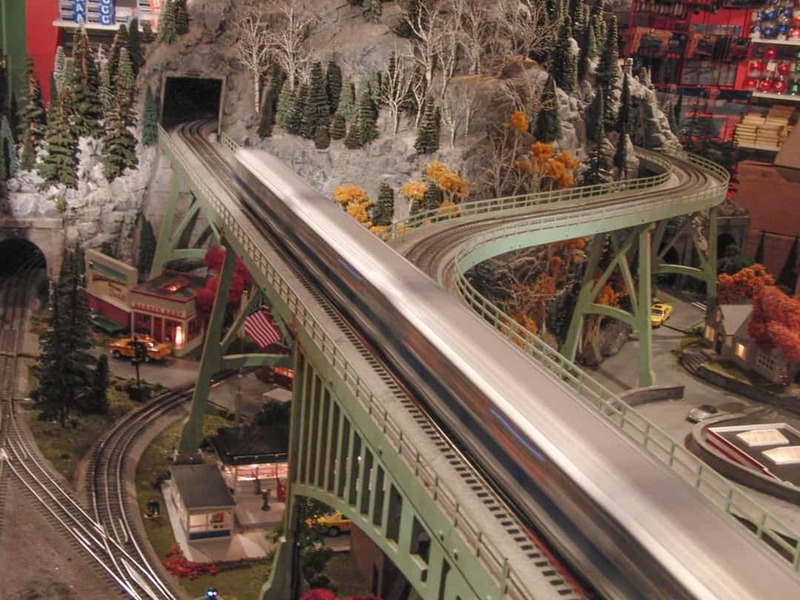 Real train enthusiasts will want to make the trek to the New York Botanical Garden in the Bronx for the Holiday Train Show, which is easily accessed taking the commuter rail from Grand Central Station. Photo courtesy of the New York Botanical Garden. 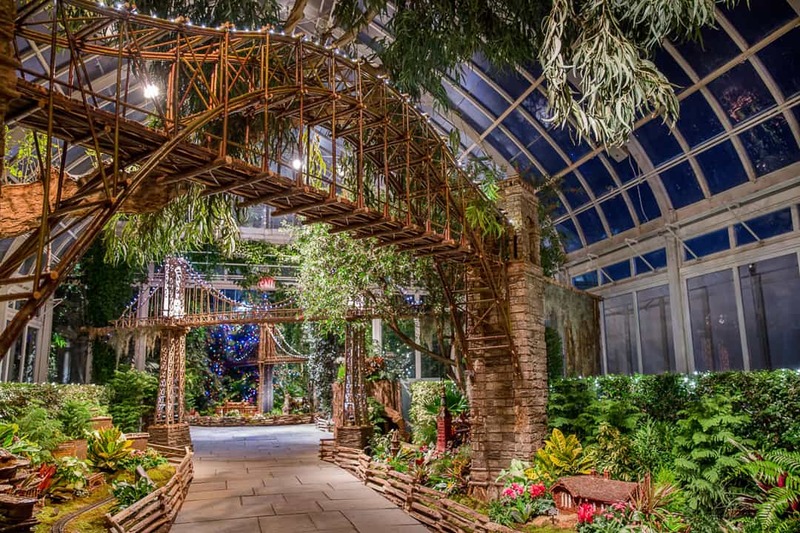 In addition to the giant two-story displays of trains honoring the skyscrapers of New York, the New York Botanical Garden offers Evergreen Express, a seasonal day of family programming on weekends that involves crafts, a train ride, and more interactive games and puppet performances. 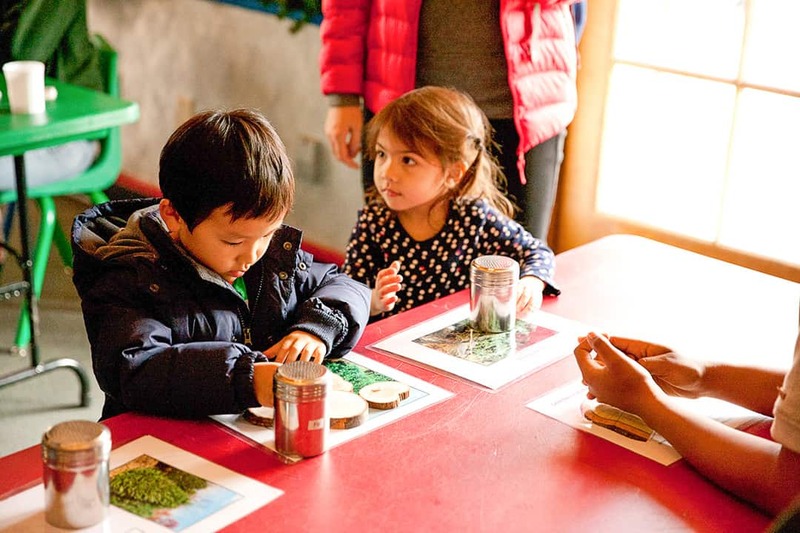 The Evergreen Express weekend program offers crafts and activities for young children at the Botanical Garden. An easier and shorter train experience is just inside Grand Central Station. The New York Transit Museum located the Passageway shops produces a beautiful holiday train display and provide a nice outing during freezing temperatures. Photo courtesy of the New York Transit Museum. Families can peruse local craftsmen in Grand Central’s Christmas market inside the train station before or after. DŌ serves cookie doughs like an ice cream parlor. The New York City Fire Museum located in Soho has an annual Santa rescue were the brave New York fire department rescue Santa from the roof of their building. This year this rescue performance occurs Sunday, December 3 at 11:30AM perfect to combine with brunch at The Dutch, famous for their donut trees. 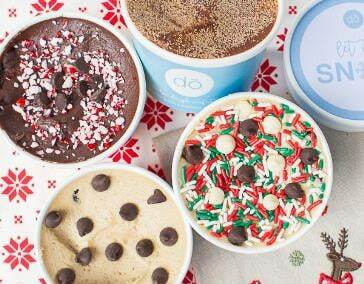 If you’ve heard about the cookie dough sensation, DŌ (like cookie dough) is located nearby for a scoop of signature chocolate chip, holiday cake batter, peppermint hot cocoa, or gingerbread dough served like ice cream. 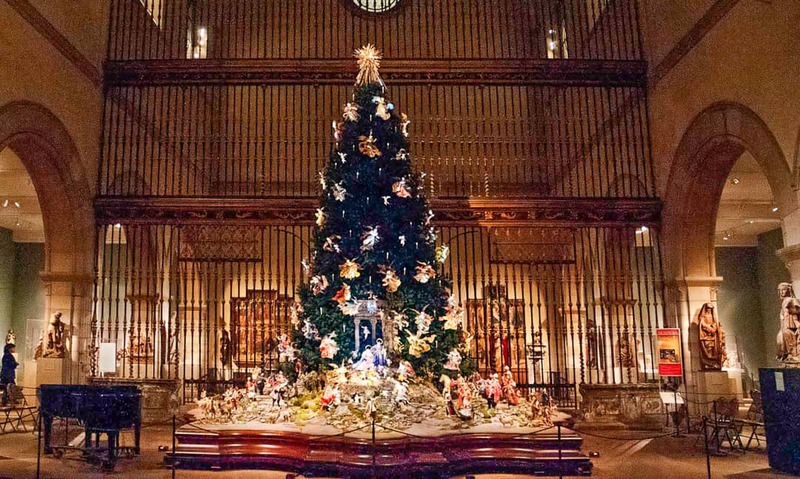 Most of New York’s museums get into the holiday spirit by displaying impressive trees. The Museum of Natural History displays a massive origami holiday tree November 20th to January 7 this year. The Cloister, The Metropolitan Museum’s location at the northern tip of Manhattan offers two Christmas performances: The Eton Chior Christmas and The Waverley Consort. Both concerts generously extend children’s tickets for one dollar each with paying adults. For those wondering how child friendly the Met’s medieval outpost is, lure them with imagery that will remind them of Hogwarts. The Christmas Tree and Neapolitan Baroque Crèche at the Metropolitan Museum of Art has a daily lighting ceremony. Photo courtesy of the Metropolitan Museum of Art. On Friday evenings, head to the Met, which is open until nine to see the magnificent Christmas tree. On Fridays there are tree lighting ceremonies and 4:30, 5:30, and 6:30 PM. As you walk around, you will hear pop up concerts of hymns and chorals from the Byzantine Empire. 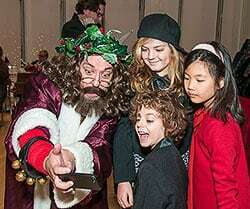 In early December the Morgan Library and Museum hosts a Winter Family Fair that’s free with admission. Each year revolves around a literary theme of performances, costumed characters, children’s crafts, and story telling. This year‘s theme is Dicken’s A Christmas Carol. As you dodge creepy Ebenezer Scrooge among many other characters in Renzo Piano’s new addition of the museum, don’t overlook the original Morgan residence for gilded age brilliance. Young kids can enjoy a screening The Muppet Christmas Carol, too. There are several holiday markets throughout the city where families can browse and look at toys and Christmas crafts. During really bad weather Grand Central offers one inside. My favorite is at Bryant Park because there’s also an ice rink set up to enjoy before or after. Union Square in Columbus Circle both have outdoor holiday markets to, so depending on what neighborhood you’re in a holiday market isn’t far away. 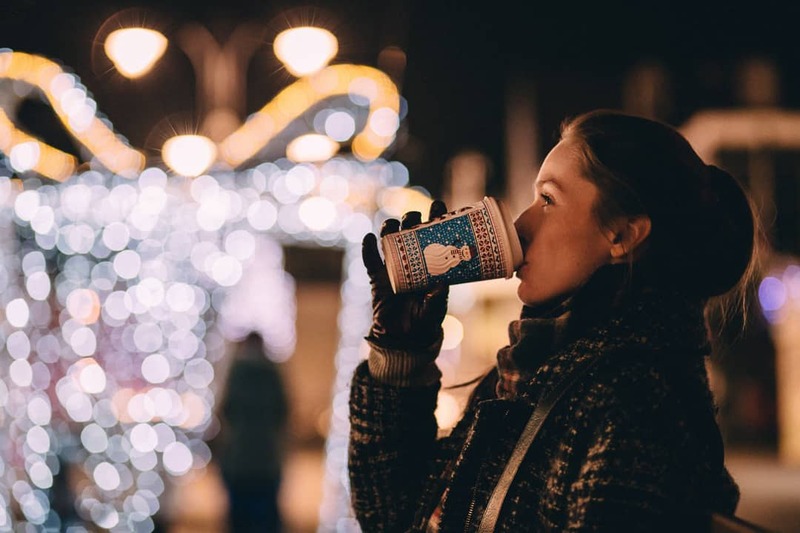 Grab hot chocolate and walk Fifth Avenue to enjoy the department store window displays. The Fifth Avenue department stores create window displays for the holidays that draw crowds, but they are worth seeing. Bergdorf Goodman, Saks Fifth Avenue, and Lord and Taylor put out all the stops. You’ll pass the Rockefeller Center Christmas tree, too, as well as the holiday light display at Fifth Avenue and 57th Street. When you are ready for something different, however, head straight to the closest Flying Tiger Copenhagen. 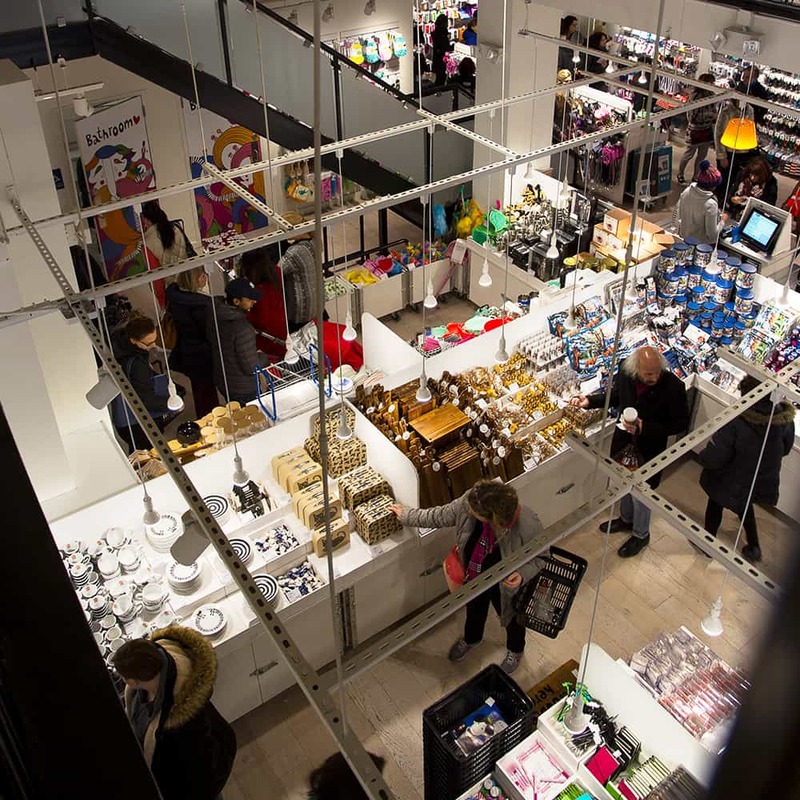 These funky novelty stores from Europe with prices lower than IKEA is every child’s shopping paradise. One is across from the Museum of Natural History. Flying Tiger Copenhagen is a quirky and inexpensive novelty store that can entrance kids for hours and a few dollars. Everything is inexpensive, and children can spend hours browsing and purchasing with a tab under $20. Or it’s the perfect place to fill your kids’ stockings if they’re not with you. Although the stores have been in Europe since the 90s, New York City and New Jersey are the only US locations. There are too many great restaurants to list for families. While New Yorkers might avoid this favorite tourist haunt the rest of the year, during the holidays, its charm lures the most jaded locals. The Tavern on the Green used to be an incredibly popular experience for Thanksgiving, Christmas Eve, and Christmas dinners before it closed in 2009. It re-opened in 2014 with a new restaurant team from Philadelphia. It’s a little touristy, and there are very few New Yorkers actually dining around you, but it doesn’t really matter. 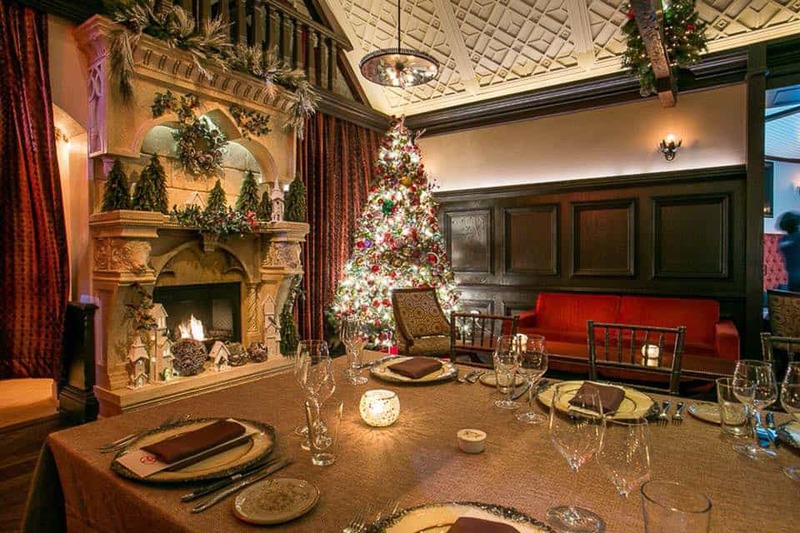 The Central Park location is really, really beautiful and feels like the place to be during a special holiday meal. As with restaurants, there are many, many great hotels in New York, depending on what part of town you prefer. During the holidays, we really enjoy a break from the Midtown sidewalk crowds and head to the Upper East Side. 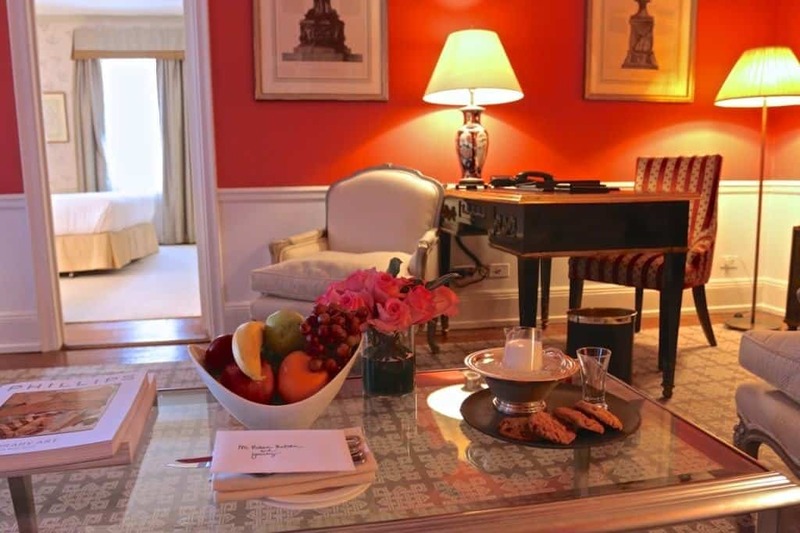 We book The Carlyle or The Mark where we are close to Madison Avenue window shopping and Museum Mile. A lovely welcome at the Carlyle Hotel. Their suites have a residential feel. In midtown, my kids love the St. Regis butler service. They quickly learn every door knock could be a tray of cookies, and we love the grandeur and architectural detail of the rooms. 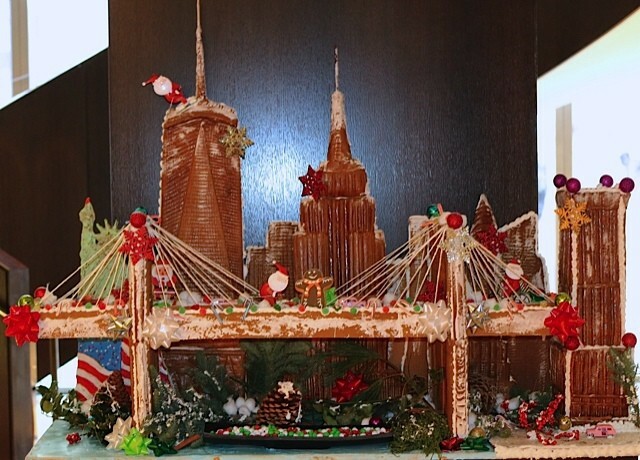 The Langham Place gingerbread Empire State building. For real space, you can’t beat the Langham Place near Bryant Park with family suites that also offer kitchens and views of the Empire State Building. Downtown has experienced a real Renaissance, so if you prefer easier access to SoHo, Chinatown, and Brooklyn, look at the new Four Seasons that has an indoor pool. For more affordable family suites, check out The Shelburne near Grand Central Station or the Hotel Beacon on the Upper West Side. We love the city during the holiday seasons. 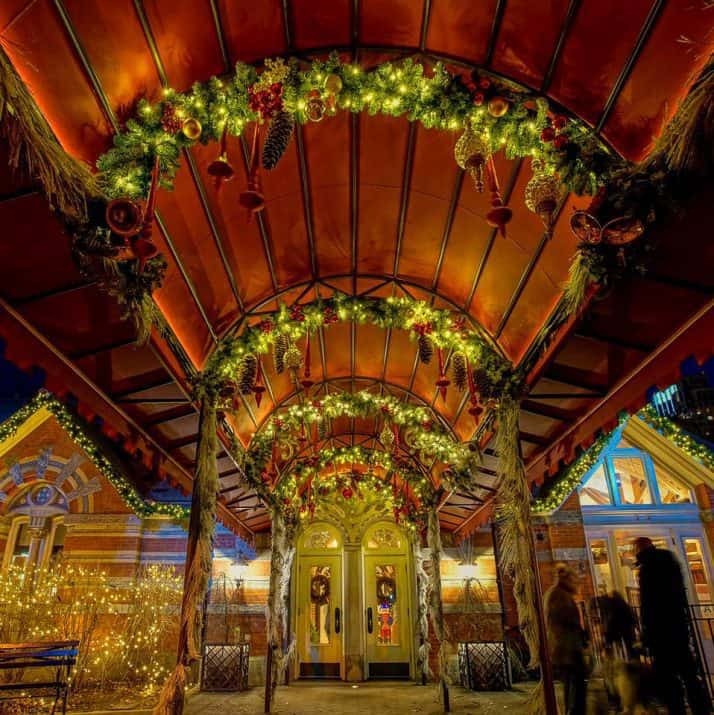 Subscribe to receive our upcoming holiday guide to London!